Just 341 days 20 hours until the fun starts! 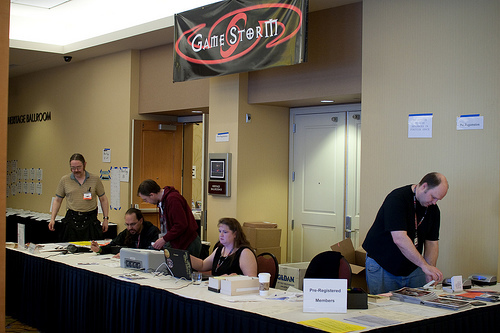 Four day membership for GameStorm 21. 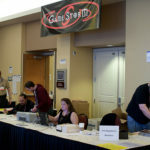 Four day membership for GameStorm 22. This membership will grant you access to the entire convention on March 28th thru March 31st. Purchase GameStorm memberships by adding them to your cart and following the online checkout process. Membership prices are reduced if you pre-register early. The Membership Pricing Schedule page lists the schedule of changes to the pre-registration prices for adult memberships, as well as the at-con full weekend and single day memberships.. Single day memberships are only available at-con. If you wish to pay by check or money order, please use the mail in registration form (once it’s updated). All memberships are subject to the Code of Conduct. Memberships for children are subject to the Children policy and will require a waiver (15 and over or under 15) <– these forms are outdated currently, they’ll be updated soon.